Kim Cattrall | WHAT A FEELING! Turk 182! is one of those inscrutable titles that film studios hope will prove intriguing enough to lure the ticket-buying public. That’s what they think, anyway. The movie behind the title turns out to be an ordinary entry in the reliably popular (and populist) little-guy-against-the-system genre. These plots usually spring out of some injustice that our hero needs to make right, which gives the filmmakers the chance to whip up some Pavlovian rage and send the audience into a good heavy-lathered sweat. Well…Turk 1982! doesn’t perceptibly raise the perspiration level. It punches the right buttons in getting its anti-Establishment points across, but the proceedings are too automatic to lift it above the level of a programmer. The injustice here centers on an off-duty New York firefighter (Robert Urich) who, while having a beer, sees a fire taking place across the street. He rushes over, fights his way through the blaze to save a little girl’s life, then accidentally falls through a window and racks himself up pretty seriously. Cut to six months later: The fireman’s physical wounds have healed, but he’s off the force and ineligible for his pension benefits because he was under the influence while performing the rescue mission. Enter his shiftless younger brother (Timothy Hutton), who revs himself up with righteous anger and takes the case to city hall. When the slimy mayor (Robert Culp) won’t listen to him, Hutton papers the walls of the mayor’s office with his brother’s benefit-rejection letters. Then he figures if he goes on a spree of graffiti-perpetrating, he might just get the attention of the powers-that-be. He aims his barbs at the mayor, to embarrass him into examining his brother’s case. He plants a mysterious signature (Turk 182) on highly visible landmarks—a graffiti-proof subway car that the mayor is dedicating personally; on the posterior of the city’s mounted police; on the huge scoreboard at a Giants game, where the mayor hopes to pick up a campaign boost and gets booted instead. The unknown Turk 182 becomes a local hero, and the mayor sends some cops (Peter Boyle and Darren McGavin) out to track him down. It’s not a bad idea, but let’s face it, it’s not particularly great either. The execution of this idea, under the loose (and sometimes agreeably funky) direction of Bob (Porky’s) Clark, is similarly wishy-washy. There’s the perfunctory love interest (Kim Cattrall) for our sensitive hero, and the perfunctory tender scenes of brudderly love, etc. Hutton is okay; he clearly enjoys playing rebellious roles, and he’s effective in them. One note to the filmmakers: in Hutton’s last scene, when he is supposed to be triumphant, his face is bathed in stark lighting from below. Such is the topography of Hutton’s face that this lighting emphasizes his resemblance to a weasel, which is probably not the effect the filmmakers wanted to get for this outlaw hero in his ultimate victory. This was maybe the most mystifying of the mystifying run of movies Hutton made after winning an Oscar for Ordinary People and presumably having some heat in Hollywood (see also Iceman and The Falcon and the Snowman). 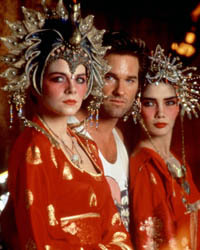 It is very much of the Eighties, even if the basic idea seems like a Seventies stick-it-to-the-man leftover. With Mannequin, we have the latest variation of the Pygmalion theme; a guy gives life to an inanimate model, which in turn teaches him to be a human being. It is to be hoped that the age-old story will never again be played out in terms as degraded as these. The sappy premise is that a struggling young sculptor (Andrew McCarthy) creates a lovingly contoured plastic woman during his brief employment at a mannequin factory. Later, he sees this mannequin, for which he has developed an unnatural yen, in the window of a department store, and he lands a job there. One night, while talking to his segmented pal after closing time, she comes to life (and is played by Kim Cattrall). She explains that she is the latest incarnation of an Egyptian princess who has enjoyed a series of lives through the centuries. Pygmalion enters the world of Shirley MacLaine. It turns out she can only come alive when alone in the presence of our hero. She doesn’t offer any explanation; besides, the film would be over if they could go home happily together. And the movie is full of such nonsensical loopholes. Michael Gottlieb is the director, and he seems to have no shred of style; every composition looks clumsy, every gag shot is held a beat too long. He’s left his actors at sea. McCarthy, the Brat Pack member usually called upon to be the sensitive type (as in St. Elmo’s Fire), would appear to be good casting as the lonely artist, but he’s too interior-directed to bring off the later comedic scenes, and he doesn’t yet have the star quality to carry the movie on his own. Cattrall is energetic and well sculpted, but she really has no character to play. The rest of the film is littered with stock types, including the crusty but lovable department-store owner, the swishy window dresser, the malevolent security guard, and the oily store manager. Only the latter is interesting, mainly because the actor, James Spader, is obviously off doing his own outrageous thing, a kind of super-unctuous William F. Buckley (if that’s not redundant). Spader goes too far, but at least he’s trying. 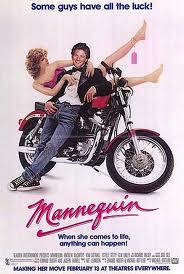 You can sense from the first five minutes that Mannequin is awkwardly assembled and stiff. Sure enough, it never does come to life. In other words, it’s one of those movies too well titled. Did not care for this movie. Really did not care for it. But it was a box-office hit, which tells you all kinds of things about timing and certain actors cresting at the right moment and perhaps the durability of archetypal storylines, although I really don’t want to think too hard about it. It was easy to notice Spader, who’d already made an impression in things like Tuff Turf and Pretty in Pink, and was about to break through. I have a terrible feeling there was a Starship song associated with this movie.